The Sigelei Moonshot 24 RTA (rebuildable tank atomizer) is the follow-up to the Moonshot, a smash hit product by Sigelei. Combining dual 5mm diameter inner air holes, a larger 15mm by 1.5mm dual adjustable airflow, and a 50% increase in tank capacity puts the Moonshot 24 RTA at the top of the RTA game. It boasts a gold plated non-redirected positive pin and quad 3mm diameter wick ports, resulting in great performance. To get the lowest price on the Sigelei Moonshot 24 RTA, grab yours directly from the manufacturer. Disclosure: All the RTAs which we review on this website are tested by our trained, paid staff. As part of the review, VapingDaily.com links directly to the product or brands so that you may purchase directly from the provider. We receive commissions from these providers, however, this does not affect the price you pay, and the commissions we earn help us pay for the costs of running this website. Click here to learn more. Thank you. 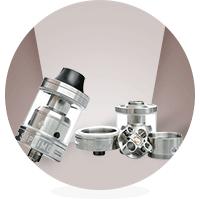 Upon the first glance at the Moonshot 24 RTA, you can see that the unit is very well made and that all the parts fit perfectly together. The AFC ring presents the perfect amount of resistance and is easily adjustable, yet it stays exactly where it is after adjusting. The threading is smooth, and the outside is very attractive. Because of its transparent design, the tank looks amazing with any style and color of the mod. The device is very easy to fill, as it has two big top fill holes. With the 2ml capacity – which isn’t the biggest – it doesn’t need juice flow control, which is great if you plan on filling the device often. The Moonshot 24 RTA provides a huge airflow and won’t disappoint when the user who prefers a direct to lung device. The large airflow control ring slots feed 5mm air holes beneath each of the coils. The chimney stem’s large diameter helps with the airflow so that it won’t choke it off. It’s amazing how you can customize your overall vaping experience by simply adjusting the airflow. Because the 3.5mm diameter coils offer plenty of wick to fill the 3mm wick slots, it adequately covers the juice holes in the chimney. On top of that, the customizable airflow ensures the Sigelei Moonshot 24 RTA certainly doesn’t disappoint when it comes to flavor. Once built and wicked, the Moonshot provides unbelievable clouds. The wide-bore competition drip tip can cause a bit of ‘’spitback’’ now and then, but it is easy to correct by simply adjusting the airflow and wattage. When paired with a high-power mod, the tank can get a bit warm, but the airflow and advanced technology allow for quick cooling. The vapor is smooth, and the flavor comes very close to what you might get when using an RDA device. Some users might complain about the tank size, but on the bright side, it is easy to refill, and it produces better flavor than a larger tank would have done. The Moonshot 24 RTA has a unique aesthetic to it and boasts a compact design. It does have a similar build process to some other, more expensive RTAs in the same class – the deck removes from the base and is secured by the vapor chamber center barrel. It sounds easier than it is, so expect to take some time when building the device. When you’re done, you will have one of the most powerful RTA systems on the market, which is easier to maintain and more customizable than most of its competitors. The best recommendation is to take the device 100% apart and cleaning it with hot water and dish soap. Alternately you can use rubbing alcohol and cotton swabs. Paper clips are excellent to poke through the air slots to make sure that any residue is removed. Remember to rinse properly after cleaning, so there’s no soapy smell. Leave the parts to dry before reassembling. The Moonshot 24 RTA is an advanced user item. Always follow the instructions carefully and assemble using proper precautions and handling. Make sure that your Moonshot 24 is compatible with your set-up, which doesn’t include a hybrid or hybrid style device. Never use a short or flat 510 connection on such a device. The Sigelei Moonshot 24 RTA is a great product, boasting great new features in the upgraded design. It is, however, recommended for advanced vapers, as it can be a difficult task to assemble and if you are unsure of what you are doing, the results can turn out to be hazardous. Advanced users will love the thick, flavorful clouds. The new improved design and added features just sweeten the deal. The best thing is that it’s extremely affordable, and you can get it at the lowest price from the manufacturer. The Smoant Mobula RTA is not your ordinary looking RTA. In this case, it is good. However, will its quirky appearance equate to a good vape? Let’s find out. It is the latest version of the prestigious Kayfun model of RTAs. The Kayfun V5 looks like the best so far. Now, is it worthy? Read on to find out.